The cushion sea star - reddish-orange with five leather-like arms - inhabits what we call a picture-perfect beach. Fine-grained sand and crystal clear seas silhouetted by a palm tree shore. Here in this edge habitat, where the land meets the ocean, sea stars behave gregariously, gathering in huge numbers to feed and breed. In 1996, when Dr. Lahanas and his colleagues opened the Institute for Tropical Ecology and Conservation (ITEC), there were no tourists, no restaurants, no souvenir shops at the beach. It was, Lahanas explained, an “empty little beach that nobody [from the outside] really knew about.” It was an ideal site for biologists to study marine ecology, and likewise, for local fishermen to find fish and lobster. Around 2003 and 2004, though, the tourism industry also began to discover the beach. One restaurant opened along the waterfront, and then another and another, and soon enough, the area was full of business and visitors. The sand and water, which attracted starfish for countless years, now attracted another gregarious species. When the tourists arrived, the cushion sea stars started to disappear. Today fewer than two-dozen starfish can be found in the area. It took millions of years for the Archipelago of Bocas del Toro to form its diverse ecosystem of sand, seagrass, mangroves, and reef; but it has taken less than twenty years of development to seriously threaten that complex environment. The starfish’s decline is not an isolated case. A decade ago, as one researcher remembers, “you could order large, medium, or small fish for dinner in Bocas. But not any more - its just one size - small!” In a brief period of ecological time, from the early-1990s to the mid-2000s, the fishing industry collapsed. A parallel decline has also occurred with the Caribbean Spiny Lobster. The bulk of seafood now served in restaurants lining Bocas’ picturesque coastline actually comes from across the mountains, from the Pacific Ocean. Driving these developments in Bocas are an estimated 120,000 tourists that annually visit the islands desiring seafood, service, and fun. The growth of tourism has created much-needed employment for a struggling community. As one hotel owner explained, “When I was young, there was no work in Bocas. You either had to go to Panama City, or the mainland to work on the banana plantations.” Because of tourism, Bocas’ millennial generation has found work at home, as tour guides and service workers. But is it really necessary to trade work for ecological health? Conservation has not kept apace with the influx of foreign interest and investment. Untreated sewage, runoff, and sediment pour into the sea, suffocating reefs and other organisms dependent on clean water and light. Algal blooms flourish in the bay. Coral bleaching, already spurred by global warming, increases with local actions (and inaction.) The combination of overfishing, pollution, and climate change has turned Bocas into another tale of environmental declension. Meanwhile, tour companies, developers, and the Panamanian government promote Bocas as an untouched “paradise,” waiting to be discovered. Visitors, it seems, are unaware of the consequences below the surface of their visit. They arrive to the beautiful islands, and quietly, the sea stars, the fish, and the lobster disappear. What type of paradise is that? In Bocas, a small yet committed community of activists are working to combat environmental problems accompanying tourism development. They have pushed forward a progressive platform of regulations - for marine protected areas, turtle nesting grounds, and a seasonal lobster moratorium. But many of these policies remain unenforced. Why? “The root of the disease,” in the words of the ecological thinker William Ophlus, “is not defective public policies but a defective public philosophy.” If both locals and tourists do not respect or understand the meaning behind the law, the law or policy is irrelevant. 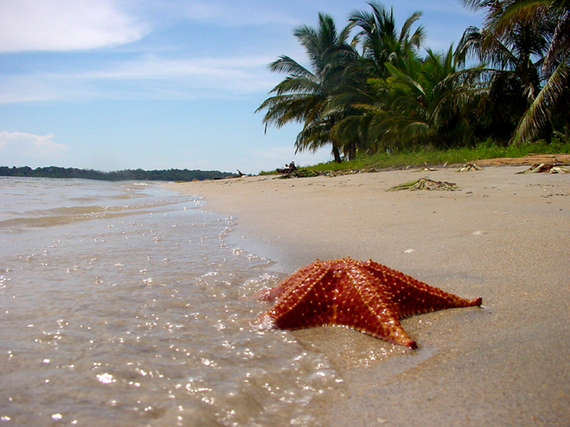 According to ITEC researchers, the cushion sea star abandoned its namesake beach because of increasing human disturbance. Sea stars are extremely sensitive to vibrations in the water. The crowd of new visitors kicked up sand (creating turbidity); curious beachcombers would touch the animal and lift them out of the water (causing air to enter the marine invertebrates body and later float to the surface); and party-going visitors produced a cacophony of music, motors, and noise (which reverberated in the marine environment). Starfish interpreted these actions as a threat and crawled downhill into deeper water, withdrawing from their traditional breeding ground. The herd of tourists, from the perspective of the sea star, was an invasive species. 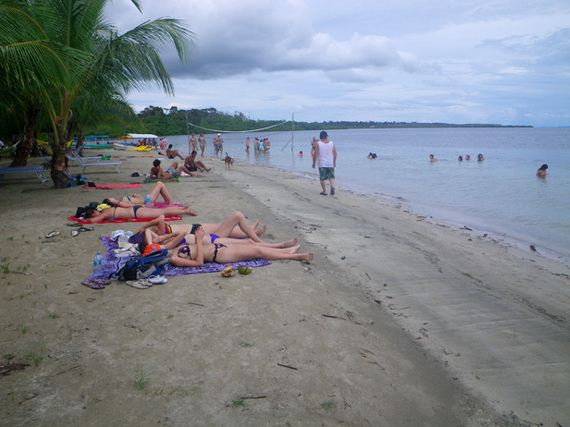 What happened at this particular tourist beach in Panama is perhaps an allegory of modern ecological folly. Contrary to carefree looking brochures and cruise ship advertisements, there is no such thing as a vacation “escape.” To sit on that beach, to swim on that reef, is to be part of nature. Note: Special thanks to students and staff at The School for Field Studies and the Institute for Tropical Ecology and Conservation for their help. All images by ITEC.